No, you’re not seeing double! 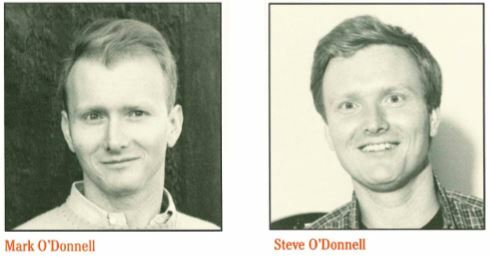 Twins Mark and Steve O’Donnell are both College Now Greater Cleveland (formerly Cleveland Scholarship Programs) alumni, and they found success as nationally recognized writers. Mark and Steve, 1972 graduates of John Marshall High School, credit College Now advisor Carolyn Beeler with helping them get their start. With Carolyn’s help, the twins gained acceptance to Harvard University, where they found success as writers for Harvard’s renowned satire publication The Harvard Lampoon. After graduating from Harvard in 1976, Mark and Steve embarked on slightly different journeys to becoming renowned for their respective works. After starting his career writing quips for cards at American Greetings, Steve relocated to New York, applying for positions as a writer for TV shows. In 1982, he was hired as a writer for David Letterman, eventually achieving the position of head writer for 158 episodes of Late Night with David Letterman. During his time as head writer, Steve developed the iconic “Top Ten List,” a long running, well-received segment of the show. After leaving Late Night in 1995, Steve went on to write for The Dana Carvey Show, The Simpsons, Seinfeld, The Chris Rock Show and more, before being hired as head writer for Jimmy Kimmel Live! in 2003. After his departure from Jimmy Kimmel in 2008, he wrote for The Bonnie Hunt Show and Norm Macdonald Live. His sharp wit and excellence as a writer has not gone unnoticed, leading to Steve receiving four Primetime Emmys and 20 nominations. Today, he resides in Los Angeles, continuing to write for TV. Mark found success in humorous writing, as well. After his graduation from Harvard, he went on to publish stories, essays and poems in Ploughshares, The New Republic, The New Yorker, The Atlantic Monthly, Rolling Stone, Spy and The New York Times, as well as books Let Nothing You Dismay (1998), Getting Over Homer (1996), Vertigo Park and Other Tall Tales (1993), and Elementary Education (1985). Most notable, however, is his work in theater. His plays include “That’s It, Folks!,” “Fables for Friends,” “The Nice and the Nasty,” “Strangers on Earth,” “Vertigo Park,” and the musical “Tots in Tinseltown.” In 2002, he and collaborator Thomas Meehan wrote the book for the Broadway musical “Hairspray,” which earned them the 2003 Tony Award for Best Book of a Musical. Mark and Thomas also worked on the musical adaptation for the show “Cry-Baby,” earning them a 2008 Tony nomination for the same category. In 2012, Mark passed away at his home in Manhattan. He was 58.